Born into a wealthy New York family in 1898, Marguerite 'Peggy' Guggenheim was one of the greatest art collectors of the 20th century. Using her inheritance to open her first art gallery, Peggy's love of art lead her to eventually settle in Venice, where she relaunched her life after becoming the star of the 1948 Venice Art Biennale. For her, a life without the inspiration of her artist and writer friends would have been unthinkable. 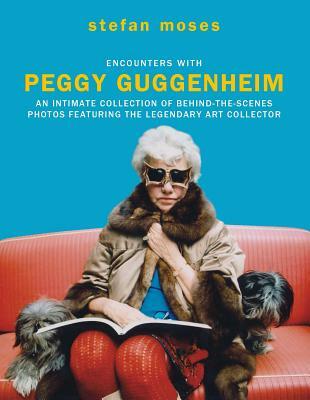 In Encounters with Peggy Guggenheim, renowned photographer Stefan Moses reveals his collection of photographs of Peggy, taken between 1969 and 1974, many of which have never been seen before. Striking, eccentric and dramatic, Moses photographed Peggy in her favorite places around Venice, as well as in her private palazzo at Canal Grande. See Peggy as she glides on her gondola with her Lhasa apso dogs, wearing her iconic butterfly glasses made by Edward Melcarth -- the quickness and talent of Moses captures the character of this true eccentric. An inspiration for art-, photography- and fashion-lovers alike, Encounters with Peggy Guggenheim is a behind-the-scenes look at of one of the world's most eccentric and inspirational women. Born in Silesia in 1928, Stefan Moses has lived in Munich since 1950 and has been a photographer since childhood. During World War II he was detained a Nazi concentration camp, but managed to escape in 1945, and despite the horrors, remained in Germany. Here he began to document photo essays of the country's inhabitants, including prominent artists, writers, intellectuals, street-sweepers and the working classes. He is one of the most distinctive portrait photographers of our time.